The markets around the world have in recent days been following the latest statements out of the White House on trade. The American president's announcement last week that he intends to impose a 25% tariff on steel and 10% on aluminium in an attempt to protect US industry has sent shockwaves around the world. The European Union has responed with strong criticism and said they would retaliate with new tariffs on U.S. goods, including Harley-Davidson motorbikes, bourbon whiskey and Levi's jeans. The reponse from the White House was "if the E.U. wants to further increase their already massive tariffs and barriers on U.S. companies doing business there, we will simply apply a Tax on their Cars which freely pour into the U.S." Can we then expect that seafood will be the next victim of the looming Trump Trade War? 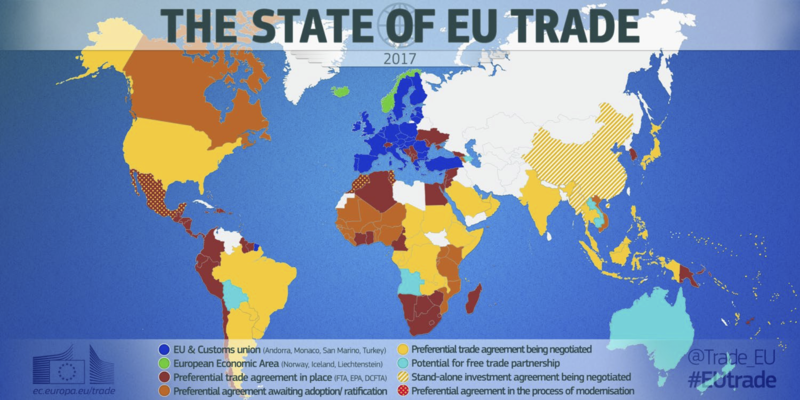 To assess this it it first useful to look at the trade relationships that EU has round the world and since the publication of this map the CETA is a trade agreement between the EU and Canada is now provisionally entered into force, so most of the agreement now applies. This further makes the trading relationships between the North American neighbors and the EU different as Canada will now enjoy access to the EU markets with 0% tariffs for seafood. The United States on the other hand has no such deal and only the MFN status applies with full tariffs for seafood imported into the EU range from 0 to 24%. For the main seafood products of interest for the United States such as Alaska pollock, frozen fillets (not for processing) having 13.7% tariffs. Under the WTO rules members can impose trade remedies or trade defence measures against imports to protect their domestic industries from unfair practices such as dumping and subsidies, or to cope with a sudden surge of foreign goods. However, its sets out comprehensive rules that members must follow in the launching, investigation and imposition of anti-dumping, countervailing and safeguard measures. 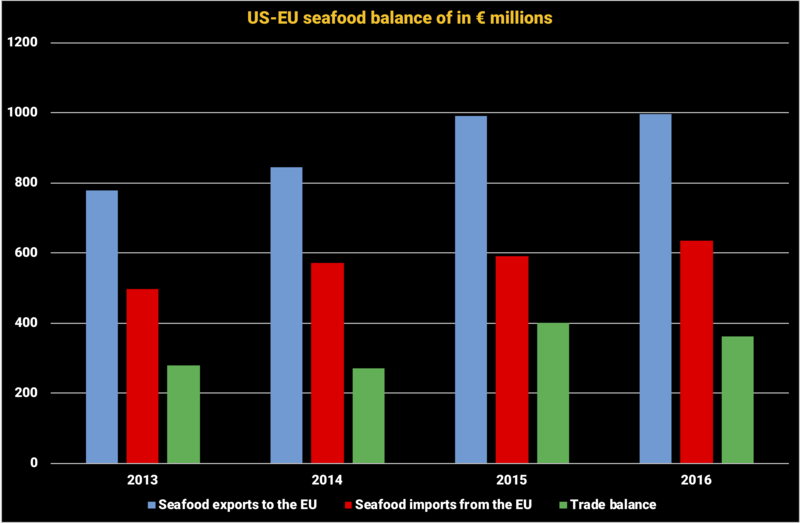 In the case of seafood it is unlikely that the United States would apply these measure simply due to the positive seafood balance of trade between the United States and the European Union. In 2016 the balace was positive for the US by € 361 million. 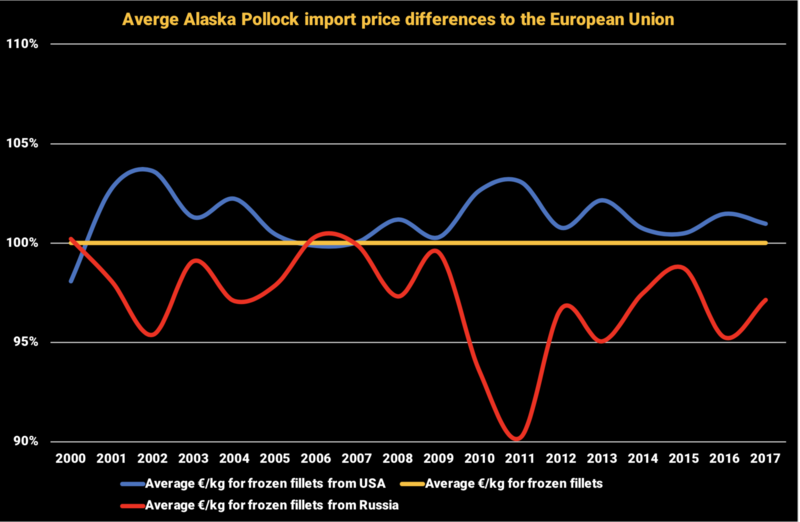 In the unlily event that the trade war excalates to to seafood it would be the US exporters of the Alaska pollock to the EU that would pay the price. This would mean that the import price difference to the EU between the United States and Russia would be eroded as the premium now enjoyed by US producers would make their products uncompetitive as any increase in tariffs would likely make the price of fillets in the EU market too high. This would mean that buyers might either seek the Russian products or simply shift their preferences to other species. As these are still speculations that have not materialized as of now there is maybe no need for the seafood sector to panic. Yet it demonstrates the potential harmful impact of any trade war. To find out more about the UE-EU trade keep following our analysis on seadatacenter.com. Please contact us at info@seadatacenter.com for more information.